3 Department of Statistics, Ankara University Faculty of Medicine, Ankara, Turkey DOI : 10.24953/turkjped.2017.02.001 Özcan B, Kavurt AS, Aydemir Ö, Gençtürk Z, Baş AY, Demirel N. SNAPPE-II and risk of neonatal morbidities in very low birth weight preterm infants. Turk J Pediatr 2017; 59: 105-112. Illness severity scores were described to estimate the mortality and morbidity risks based on data obtained shortly after admission to an intensive care unit. The aim of this study is to evaluate Scores for Neonatal Acute Physiology-Perinatal Extension-II (SNAPPE-II) as a predictors of neonatal morbidities such as bronchopulmonary dysplasia (BPD) and retinopathy of prematurity (ROP). A retrospective cohort study was conducted between October 2011- 2012. A total of 278 preterm infants born with gestational age (GA) < 32 weeks and birthweight (BW) <1,500 g were given SNAPPE-II scores based on data collected within the first 12 h of admission to ICU. The main outcomes were the development of BPD and ROP. The main variable was the SNAPPE-II obtained at admission. Logistic regression and receiver-operating characteristics (ROC) curve were calculated for SNAPPE-II. The mean GA and mean BW of the whole cohort were 29.2 weeks (± 2.15) and 1,323 g (±331,4), respectively. The median SNAPPE-II value was significantly higher among patients with BPD and ROP. After logistic regression the SNAPPE-II was independent risk factor for BPD and ROP. The best discriminative cutoff value for BPD was 14.5 (sensitivity 92%) and for ROP was 23.5 (sensitivity 80%). 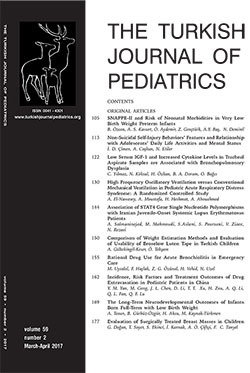 The present study reviewed an association between SNAPPE-II and neonatal morbidities including ROP and BPD. Keywords : bronchopulmonary dysplasia, neonatal morbidities, prematurity, retinopathy of prematurity, SNAPPE-II.